Using the Revised Common Lectionary Bible Study workbook, you do not have to have an extensive background in the Bible in order to lead a Bible study discussion group. Remember, you are a discussion leader, not necessarily a teacher. You can download and print a Leader’s Guide by clicking here. or by clicking on the image at left. Sit around a table or place chairs in a circle so that everyone has the opportunity for eye contact with the other participants in the discussion group. Introduce yourself and ask the discussion group participants to introduce themselves. Provide name tags so they can learn each other’s names. Start the class on time, and end on time. 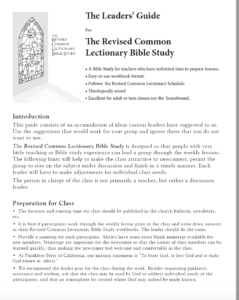 Discussion group participants should have a copy of The Revised Common Lectionary Bible Study so that they can study the questions ahead of time and write in their answers before the class. This is not a requirement, but it makes the class run more smoothly. Use only the Bible as a reference for answering questions. Try to call on everyone. Don’t let one or two participants answer most of the questions. If no one offers an answer, just go on to the next question. If someone asks you a question that you cannot answer, tell them you do not know the answer, but you will try to find out the answer for them. After class, you can ask your minister to help you with any difficult questions. Include the answers the following week during the review period. If two or more people get bogged down in a back and forth disagreement on an answer, say something such as, “I can see from the clock that, in order to finish on time, we are going to have to leave this topic and go on to the next question.” Then simply proceed to the next question. Or you can suggest that the particular topic under discussion is very interesting and can be pursued after class by those who are interested in continuing to explore that particular topic.